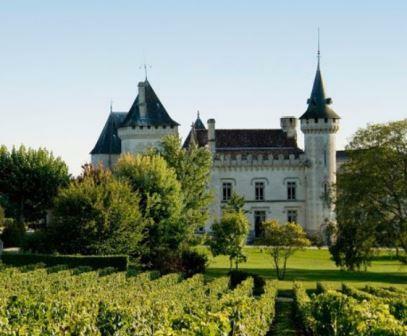 Chateau Carignan is one of the older Bordeaux estates with a long history that dates back to the middle of the 1400’s. There are parts of the impressive chateau that date back almost as far. The modern age for Chateau Carignan begins in 2007, when the negociant, Andy Lench of Bordeaux Wine Locators purchased Chateau Carignan from Philippe Pieraerts. Louis Mitjaville of Chateau Tertre Roteboeuf consults the estate on their wine making and vineyard management programs. The large, 65 hectare Bordeaux vineyard of Chateau Carignan is planted to 65% Merlot, 25% Cabernet Sauvignon and 10% Cabernet Franc. The vineyard has a terroir of clay, limestone and gravel soils. The vines are on average 20 years of age. But they have old vines that are more than 40 years of age as well. The vineyard is planted to a vine density that ranges from 5,000 vines per hectare to 7,000 vines per hectare. The harvest is conducted using a combination of machine picking and hand harvesting. To produce the wine of Chateau Carignan, whole berry vinification takes place in a combination of stainless steel vats and cement tanks. Malolactic fermentation takes place in tank and vat. The wine is aged in 15% new, French oak barrels for an average of 12 months. Chateau Carignan also produces a high end cuvee, Chateau Carignan Prima which is sold as a Premieres Cotes de Bordeaux. Chateau Carignan Prima is a Merlot dominated wine that always comes from a specific 12 hectare parcel of the estates oldest Merlot vines. The wine is aged in 100% new, French oak barrels for 18 months. Chateau Carignan is better with at least 1 years of aging in good vintages. Young vintages can be decanted for less than 1 hour, helping the wine soften to help develop the aromatic character. Older vintages might need very little decanting, just enough to remove the sediment. Chateau Carignan offers its best drinking and should reach peak maturity between 1-5 years of age after the vintage. Chateau Carignan is best served at 15.5 degrees Celsius, 60 degrees Fahrenheit. The cool, almost cellar temperature gives the wine more freshness and lift. Chateau Carignan is best paired with all types of classic meat dishes, veal, pork, beef, lamb, duck, game, roast chicken, roasted, braised and grilled dishes. Chateau Carignan is also good when matched with Asian dishes, hearty fish courses like tuna, mushrooms and pasta. Chateau Carignan also makes a dry white Bordeaux wine from a blend of 50% Sauvignon Blanc and 50% Semillon. There is a second wine, L’Orangerie de Carignan. On average, the production of Chateau Carignan is about 32,500 cases of wine per year. Soft, round and plummy with an easy drinking, red cherry and plum personality, you'll want to drink this in its first decade of life. Medium bodied, soft and with freshness in the fruit and soft tannins, there is a nice, round, fresh quality to the fruit in the finish. The wine was made from 100% Merlot. Produced from 100% Merlot, the wine is forward with round, open dark chocolate covered, black cherries and a kiss of herbs in the end note. Medium bodied, bright, crisp and very fresh red fruits with touches of olive, herbs and espresso in the soft, forward finish. From 100% Merlot, the wine is light in color, medium bodied and offers a cherry griotte personality that is for early drinking, with a slightly drying touch in the finish. Still showing youthful aromas of oak, blackberry, thyme and cocoa, another year or two in the cellar should add more softness to the medium bodied, black cherry finish. This ready to drink, medium bodied, round, Bordeaux value wine offers an espresso, black cherry, licorice and plummy personality. This is not a wine meant to make old bones. I'd drink this over the next 4-5 years.